When I was a kid growing up in the early 70s, there was no cable TV, we only got a handful of stations on our clunky old black and white television, and children’s programming was a rarity. 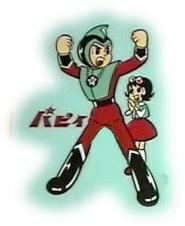 When I was 5 or 6, I used to watch a few imported Japanese cartoons (what today would be recognized as the origins of modern anime) that had been altered for American audiences. One such show left me a snippet of theme song that has lingered with me these past 35 years. Over the decades, the tune and the words have mutated, so much so that I had no idea what it was actually all about. The snippet that remained was the line, “Toe boy, the eight man.” It made no sense, of course. I eventually concluded that I was singing, “Tarzan, the ape man”, filtered through a toddler’s recollection. Now, I cannot begin to express to you how well engraved these random images of Prince Planet are in my temporal lobes. Of course, through my infantile cognitive filter, the Prince appeared mightily heroic and important. Those rock creatures in the opening segment haunted me for years as horrific incarnations of evil and terror. Seeing it now, I’m rather embarrassed that these silly stories and images had such a lasting impression on me. But that’s life, no? I guess the lesson is to realize that children process images and narratives in a much different way than adults do, and that we should never minimize the impact of seemingly innocuous or disposable children’s programming and products.